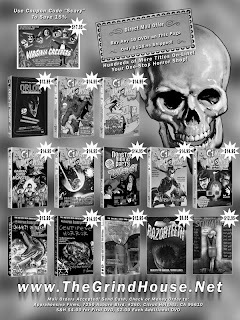 Here's a sneek peek at our new ad for Issue 76 of Scary Monsters Magazine. It's for http://www.thegrindhouse.net/ and we're running a pretty cool special for Halloween. If you order by mail any 10 DVDs in the ad for $118.95 shipped! Issue #76 of Scary Monsters Magazine should hit stores in early october!